The storytelling is captivating, describing how Shostakovich began composing the symphony under relentless bombardment in Leningrad and later finished it in Moscow, its triumphant performance in Leningrad during the siege, and how it rallied worldwide sympathy for Russia's plight. Music is at the heart of the story. As Anderson writes in the prologue, "it is a story about the power of music and its meanings," and he communicates them with seeming effortlessness in this brilliantly written, impeccably researched tour de force. A triumphant story of bravery and defiance that will shock and inspire. In a gripping narrative, helped along by ample photos and shockingly accurate historical details, Anderson offers readers a captivating account of a genius composer and the brutally stormy period in which he lived. Though easily accessible to teens, this fascinating, eye- opening, and arresting book will be just as appealing for adults. Anderson brings his narrative A-game to this dense work of nonfiction, blending the complex strands of the story into a satisfying whole. Embellished with scores of photographs and peppered with the author’s own commentary on the symphony, the text and supporting materials supply historical background for music enthusiasts and musical interpretation for history buffs. Source notes, index, and bibliography will aid report writers, but the most appreciative audience is likely to be engaged readers who settle into the tragic yet uplifting story of a suffering nation and its musical documentarian. A fascinating...examination of an important musical figure living in a time of extraordinary political and social turmoil. It culminates in a rich and moving understanding of the intersection of culture and history, and of the power of the arts to save a nation. Symphony for the City of the Dead is an intense historical account that is highly recommended reading for anyone studying World War II or readers with an interest in history or music. M.T. Anderson presents a thrilling history of music and the terrible events of World War II. 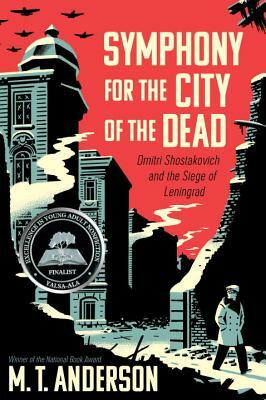 Extensively researched and passionately told, Symphony for the City of the Dead exposes the strengths and weaknesses of humanity through an engrossing tale of war, art and undying creativity. An ambitious work of nonfiction ... sweeping and emotionally charged. ...a sweeping work of narrative nonfiction for adolescent readers. A must-have for high-school classrooms and libraries. It’s the work of an author who has never jumped onto any trend-wagon, but has instead followed his own keen intelligence toward a big, essential story. [Anderson's] not just parading the events of Shostakovich’s life before the reader; he’s by the reader’s side, helping them to make sense of what they see...It’s been a while since a book about Shostakovich impressed me this much. Symphony for the City of the Dead is worth reading whatever your age. Fans of M.T. Anderson’s National Book Award-winning YA novel, “The Astonishing Life of Octavian Nothing, Traitor to the Nation Volume 1” and acclaimed dystopian novel “Feed,” will not be surprised at the brilliance of the writing and the meticulous research on display in this marvelous, compulsively readable biography of composer Dmitri Shostakovich and the great city that inspired his Seventh Symphony.